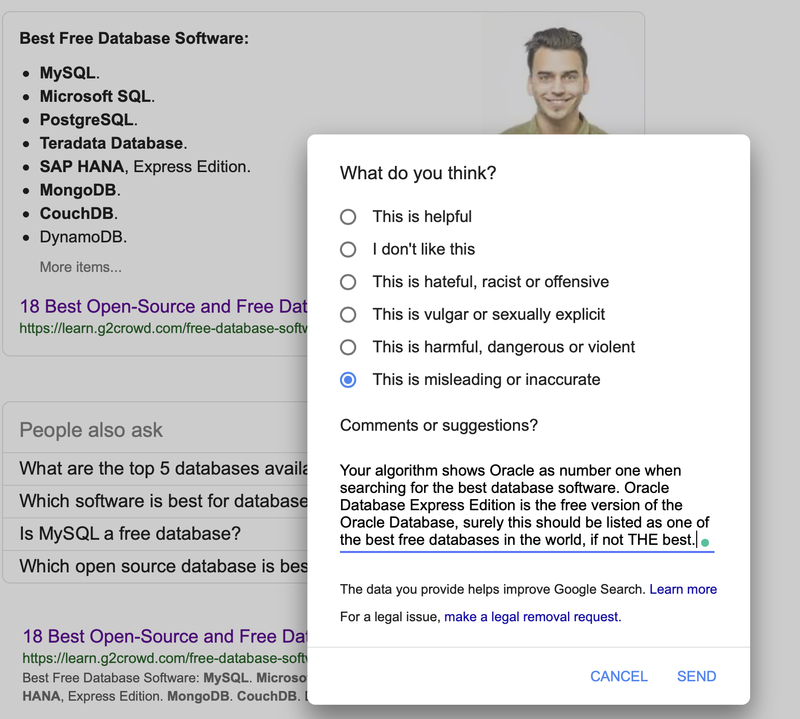 Dimitri Gielis Blog (Oracle Application Express - APEX): The best free database... Google is wrong! The above is so wrong for me, the best free database in the world is Oracle Express Edition (XE). Oracle released XE18c on October 19th, 2018. This database is unbelievable. You basically get an Enterprise Edition version and almost all options are turned on! It's amazing, the only restrictions you have is on the amount of RAM (2GB) and disk space (12GB). You even have the pluggable database architecture and can create 3 PDBs (pluggable databases). In my opinion, there is no other free database in the world that will beat this. Below I will go in more detail why I like this Oracle XE18c so much, but first, let me show you Google actually knows the right answer too. 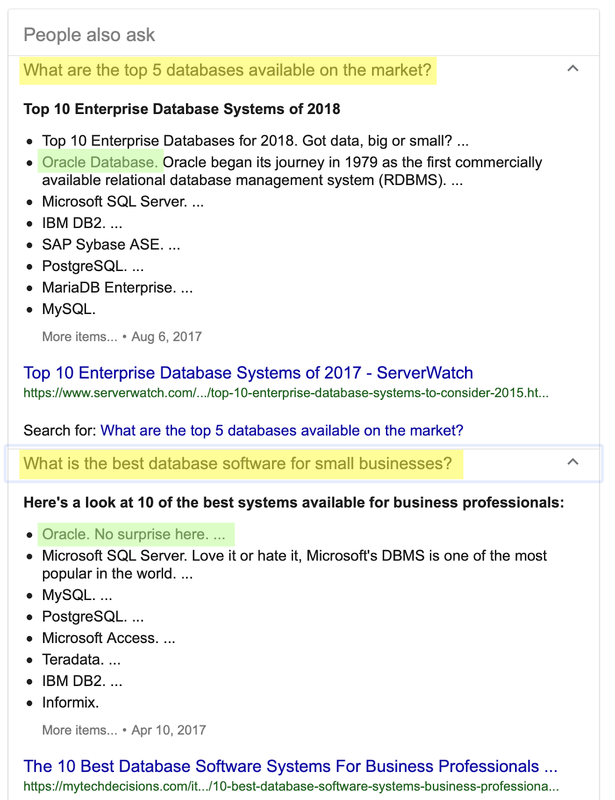 Google says "People also ask": "What are the top 5 databases available on the market?" and here Oracle is number one. The other question is "What is the best database software for small businesses?" Oracle number one again. If the question would be "What is the best database software for enterprise businesses?" Oracle is number one too, this is common knowledge. 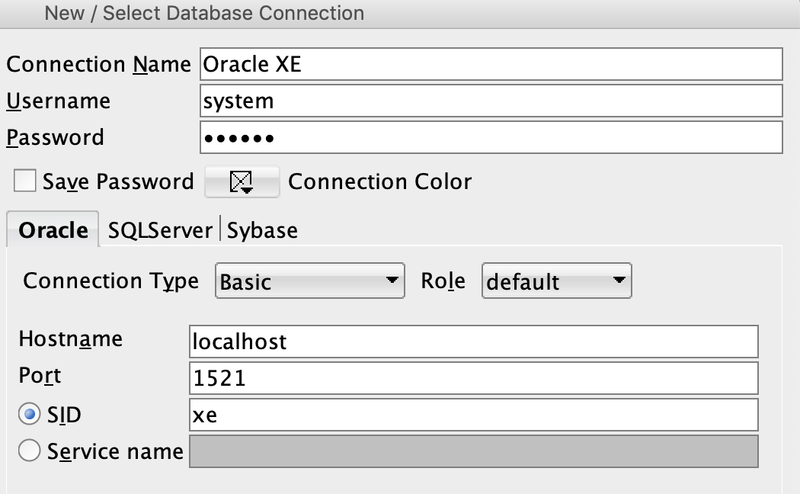 Why do I like Oracle XE 18c so much? When we talk about Oracle XE, we really talk about the full Oracle database in general. 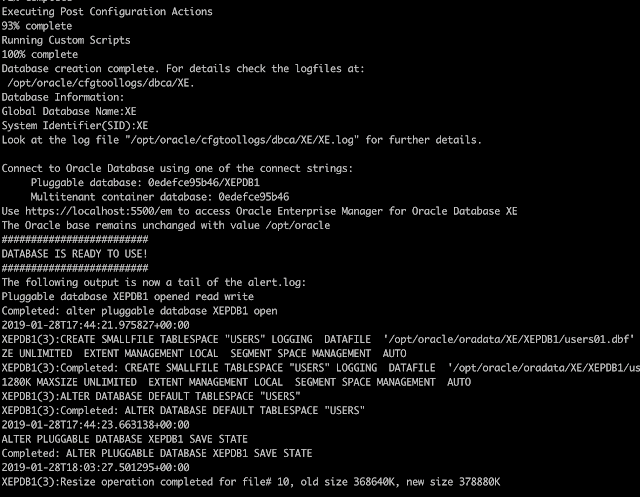 Yes, there are a couple of limitations, but nevertheless, you get the full feature set of the Oracle database! All the good stuff why Oracle shines is there: to have the best performance you can use partitioning and online index rebuilds (and in the future automatic index creation! ), to increase high availability you have the full flashback technology to your disposal, for security Oracle has VPD, Real Application Security, Database Vault... Oracle plans to release a new version of XE every year too, so you have always the latest and greatest. 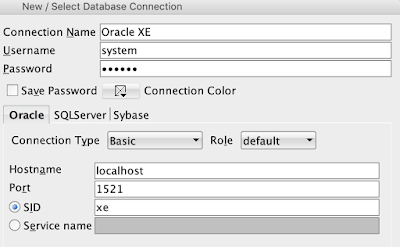 I should write another blog post why I like the Oracle database so much, but I encourage you to just try it and decide yourself. If you just want to try Oracle XE, most likely the easiest way without hitting your system, is to go with the Oracle docker container. 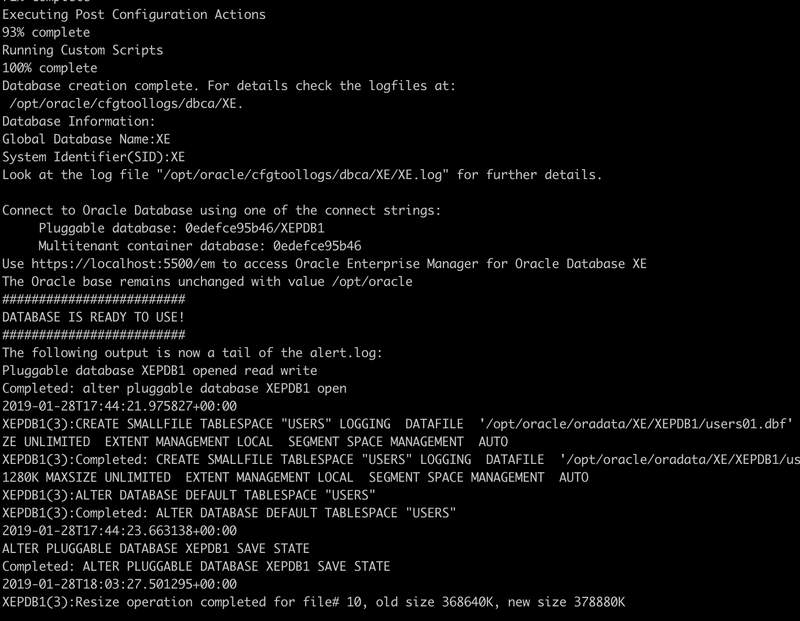 Here're the steps to get Oracle XE running in an Oracle docker container. If you don't have Docker and Git yet, download and install first. 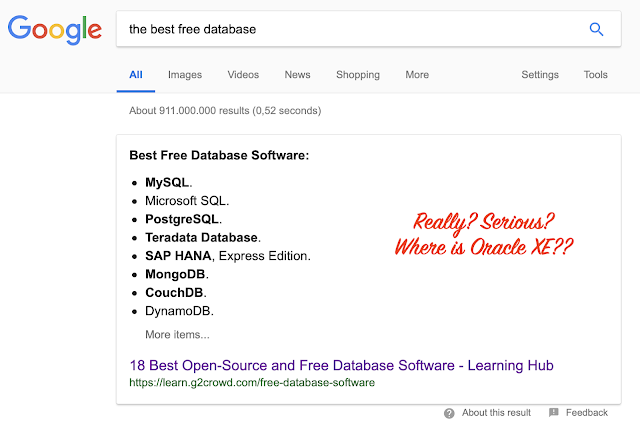 The next thing would be to install Oracle APEX, so you don't only have the best database in the world, but also the best low code platform in the world, which works absolutely awesome with the Oracle database. I agree completely. How can the author omit Oracle XE? Also see: "Oracle released the first fully functional one in 1979" Fully functional? Not. ERROR: Oracle Database Docker Image was NOT successfully created. ERROR: Check the output and correct any reported problems with the docker build operation. Excellent post Dimitri. Following your instruction to build my Oracle XE. I posted this feedback to Google search result after reading you post.
" If MS SQL is included in a result to this query then Oracle XE should also be included. Because Oracle XE 18 has all the software options available for free, with restriction only on hardware "